Colour enhanced scanning electron micrograph (SEM) of Bacillus. Bacillus is a genus of gram-positive, rod-shaped bacteria and a member of the phylum Firmicutes. Bacillus species can be obligate aerobes (oxygen reliant), or facultative anaerobes (having the ability to be aerobic or anaerobic). Ubiquitous in nature, Bacillus includes both free-living (non-parasitic) and parasitic pathogenic species. Under stressful environmental conditions, the bacteria can produce oval endospores that are not true 'spores', but to which the bacteria can reduce themselves and remain in a dormant state for very long periods. 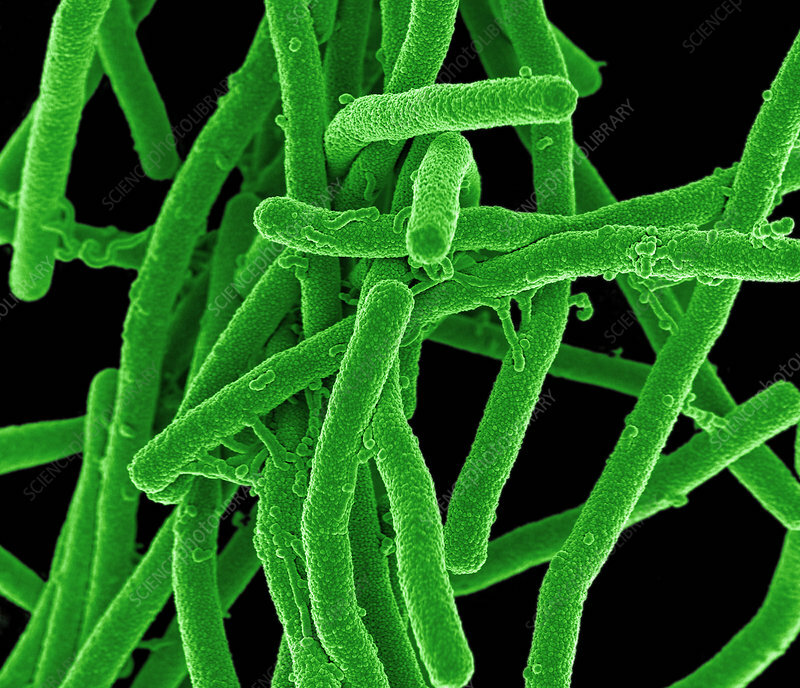 These characteristics originally defined the genus, but not all such species are closely related, and many have been moved to other genera of the Firmicutes B. subtilis has proved a valuable model for research. Other species of Bacillus are important pathogens, causing anthrax and food poisoning. Magnification 10,000x when printed 15cm.